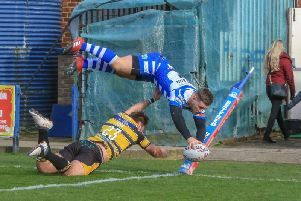 Halifax coach Richard Marshall could not mask his disappointment after seeing his side’s top four bid dented significantly by a 32-16 loss at Batley. While the scoreline flattered the Bulldogs - the game was in the melting pot at 20-16 with three minutes remaining - Fax often looked off the pace set by John Kear’s side, who produced a virtually error-free effort. “It was a scrappy performance, perhaps our scrappiest of the year, in terms of errors with the ball,” said Marshall, whose side were up against at half time when they trailed 10-6, having enjoyed the advantage of Mount Pleasant’s legendary sloping field. “We didn’t apply enough pressure; I don’t think we forced one repeat set in the entire game. “And I don’t think we played tough enough either. “There were glimpses of what we needed, Adam Tangata firing in and Dane Manning getting through a ton of work. “I wouldn’t know Dane’s tackle count, but it would be fairly high. “Batley are a good team; they’re methodical and they made very few mistakes; the stats for the first half were ridiculous. “We knew how they play, but they got the mix right today and we didn’t. “We couldn’t put their big men down. “We needed more players into contact and we needed to work them over a bit more. “They’re strong players and they rolled us today. Fax now sit a point behind Batley in sixth on the Championship ladder, with Featherstone now two points clear ahead of the Summer Bash meeting between the sides in two weeks’ time. “It’s not a lost cause by any means, and we spoke about that, but we do need to be better as a team than that,” said Marshall, who has the task of rallying his troops for Friday night’s home game against Oldham (8.0). “There are a few guys sulking in there but they’ll need to get over that because it’s a short week and Oldham on Friday. “We can’t afford any more blips now.